developed, the complex of didactic means for the research activity motivation is not properly elaborated. formation in future teachers of foreign language are the purpose of our research. pedagogical process taking into account the results of his research. the functional aspects, which are poorly connected with each other. requirements of the society, stipulates the involvement of the innovative methods of the modern teacherresearcher training. was made by famous scientists O. 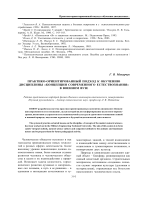 A. Abdullina, S. I. Arkhangelsky, N. V. Kuzmina, Yu. N. Kulyutkin, V. A.
considered in the works of L.N. Davydova, V. K. Elmanova, and I. Yu. Erofeyeva, I. T. Pukova, N.M.
Yakovleva; the professional readiness of the students is analyzed by E. P. Bronnikova, Z. S. Levchuk, A. I.
the students are studied by L. F. Avdeeva, N. S. Amelina, M. A. Baidang, F. M. Vivdich, G. G. Gorelova. the identity of the teacher. the solution of research tasks of different types. competence: cognitive; motivational; indicative; operational. situations to the he generalized control of the final results of the research task. the scientific and pedagogical literature and writing of the creative essays. pedagogical experience in the practice of educational institution. - The independent analysis of the obtained results. development of the pedagogical recommendations. - The writing and protection of the creative works. to higher levels of achievements. the transfer of the information while writing are interconnected and stipulated by different thinking operations. For the demonstration of the developed exercises and tasks, we prepared the table. formulate the gist of the text in one sentence or word combination. name it in the form of a sentence or word combination. with the purpose of estimation. the very beginning, then, finally. to the theme of the discussion. the key fragments, draw the scheme of the meaningful text. answer the following questions using the connective words in the brackets. formation in future foreign language teachers. means of post-experimentaldiagnostics of the research competence of the future foreign language teachers. of the future examinees, talked with teachers, chose the groups; prepared the training and controlling material. of the readiness of students to write abstracts. from the text and the level of their communicative abilities to understand and create the texts. competence formation in future foreign language teachers. sociocultural indicators of a discourse) [13, P. 5-63]. experimental work was carried out, which was considered as an essential component of the experimental work. 1. Write the meaning of the following words, or groups of words, and what you associate with them. fashion car then is compared to these two results. that has become known as Coulomb’s law. Like charges repel unlike charges attract. on the material of scientific texts was carried out by means of four steps. value was presented. Students observed the examples of the abstracts from various branches of the science. growth in all tested parameters while control groups did not show a considerable increase. and lexicon of the students, develops such qualities as creativity, reflection and critical thinking. 2. Van Pattern, B., & Lee, J. (2010). Second language acquisition – Foreign language learning. Models and methods, Washington, D.C.: Georgetown University Press. 2007. - No. 2. – P. 9-14.
added corrected and revised edition - M.: Logos, 2004. – p. 384. 8. Novikov A. M. Methodology of educational activities. M.: Egves, 2005. 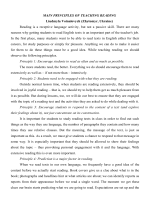 - 176 p.
educational tasks: The dissertation of the Doctor of Pedagogical Sciences. 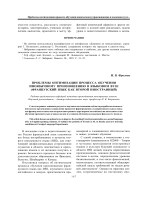 - Chelyabinsk, 2002.
regularities of creative thinking. Scientific creativity. M.: Science, 2002. – P.368. publishing house, 2001. – P. 584. High school, 2000. 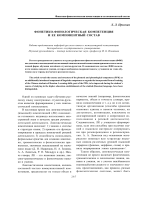 – P. 48-53.
and automatic analysis of the text: L.: Science, 2000. – P. 5-63.
school, 2009. - No. 6. – P. 29-40.
organizations across nations (2nd ed.). Thousand Oaks, CA: Sage Publications. 2012. 16. Morgan G. Images of organization /G. Morgan. — London: SAGE Publications, 2006.
and methodical articles. - Almaty, 2004. 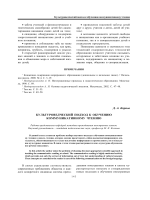 – P. 25-45.
training based on substantial generalization. Publishing house: Bearing, 2002. – P.72. Professional Education “Informatization and Education”, 2005. – 123 p.
approach. "The higher education today".-2004.-№8, P. 98-104.
at School, 2009. - No. 6. – P. 29-40. 24. Lerner I. Ya. Didactic bases of training methods. – M.: Pedagogics, 2001. – 185 p.
State University publishing house. - 2003. - 416 p.
responsible editor/ press. Herzen State Pedagogical University of Russia, publishing house St.
Petersburg, 2002. – 158 p.